Welcome lovers Camino de Santiago! Today we present a new and special contest for all those people who daily visit the web to comment on our news, hang your pictures on your social profile and interact with all the other pilgrims. As a result, the Way you Live now offers the chance to win great prizes in this particular contest Stamps that we explain below. In case you did not know, your actions in the Way She lives are rewarded with our private labels. From the web we propose a series of small challenges to meet to enhance the reputation as a pilgrim, complete the virtual Compostela step and win prizes! You can check the seals that you have got and that you have yet to achieve the SEALS section of your social profile. I also leave the full list here. This award can be enjoyed until 31 July 2017. The contest ends on September 1, 2016 at 23.59 hours. You can see below all contest rules. THE VOICE OF GALICIA, SA, established in Ronda de Outeiro 1-3 low, 15006 La Coruna, and CIF A-15000649. 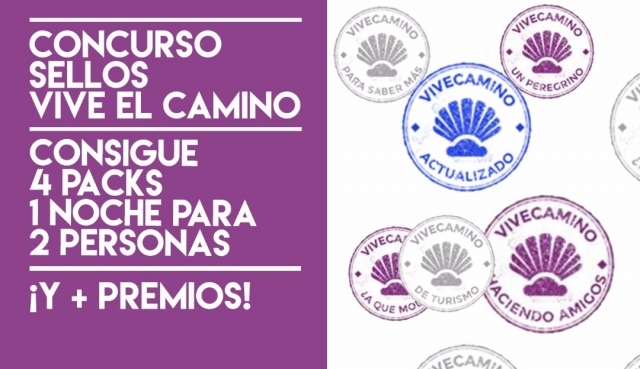 La Voz de Galicia, S. A., through Vive Camino, announces the "Stamp Contest" in the participants and users of this service will have to get at least 20 of the 47 stamps that are available on the web. They may participate between August 17, 2016 at 12.00 and September 1, 2016 at 23.59 hours. You can enter the contest any person over age of the web user and / or application Vive el Camino (https://vivecamino.com/) of La Voz de Galicia. To do this, have to be users of Live the Way, be registered on the platform, join the draw (in a thread in the forum of the web to be created for this purpose) and get at least 20 stamps of the 47 that they are available without violating the rules of behavior in the community (https://vivecamino.com/aviso-legal/). The stamps are digital honors given in exchange for users to perform different actions on the website of the Way Live: upload an image, send a comment, interact with other pilgrims, etc. These awards are automatically added to stamp counter web, so that the more will get more increases user reputation in this web and / or / application. 1st prize: is awarded to the winner of the draw among registered on the site who have signed up to the competition and have met the condition of getting at least 20 stamps users. Participation Awards: will be raffled among the other participants in the contest which also meet two conditions: have registered in the forum thread on this competition and have achieved at least 20 stamps. Each participant will be assigned a number in the draw, which will make the team lives the Way by a computer program. The prizes will be raffled on 2 September 2016 data from five (5) reserves, which, in order of selection, will serve as alternates in the event that any winner resigns or loses the right to the prize will also be drawn. La Voz de Galicia, through the personnel who manage Vive Camino, will contact the prize winners through the data they have provided in the registration. Within seven days from the draw winners must communicate to accept or reject the prize and provide an email address to receive the award. If after that time it had not been possible to contact the winner shall lose the right to the prize. The result of the contest will be published in the same forum thread is used for entering the competition and the Facebook page Vive Camino. Contestants and participants in this action, by participating, accept these rules and decisions that might take La Voz de Galicia for the purposes of interpretation or resolution of issues not covered in them. Any questions will be resolved by La Voz de Galicia. La Voz de Galicia reserves the right to modify, for justified reasons, the dates set out in the Rules 3rd and 5th. La Voz de Galicia SA, informs participants in the contest that the data provided by participants may be used by BLOGOCIO MULTIMEDIA, SL, which manages the service lives the way, for the correct operation of this action it. We inform you that personal data provided to LA VOZ DE GALICIA, S.A. when applying for their products or services they have been incorporated into files of THE VOICE OF GALICIA, S.A. which they are duly registered with the AEPD. You. Consents and expressly authorizes LA VOZ DE GALICIA, S.A. treat the data you provided to manage the provision of services covered by the application data, for studies and analysis of customer profiles and to periodically provide information about products, activities, services and actions of LA VOZ DE GALICIA, SA, of companies Group Corporation Voz de Galicia and other companies and organizations related to the fields of training and education, insurance, household assistance, editorial, NGOs, music, television, cinema, radio, communication, automotive, hotel, financial, distribution , sports, travel, employment, real estate, weather, distance selling, energy, fashion, textile, videogames, health, food, gourmet products, leisure, management, electronics and telecommunications, information may be submitted even after the end of their relationship with LA VOZ DE GALICIA, SA. In addition, the granted consent is deemed given for VOZ DE GALICIA, S.A. transfer its data to other companies in the group to which it belongs VOZ DE GALICIA, S.A. related to the publishing, audiovisual production, media (including press, radio and television) and market research, marketing and opinion, which can be found on the website referenced www.lavozdegalicia.es, in order to inform their products or services and make business deals. La Voz de Galicia, S.A. - Data protection, Avda Press 84-85, Sabón Industrial Estate, 15143 Arteixo (A Coruña), duly crediting his personality. You. Responsible for the accuracy of the data provided to La Voz de Galicia a, S.A., this reserving the right to exclude any services if you provide false information, without prejudice to any other legal action that may arise. Similarly, you. Is responsible for maintaining updated personal information you have provided to the Voice of Galicia, S.A. In any case, consent is revocable, you can. Refuse at any time the consent given or exercise any of the rights mentioned in the manner indicated in this clause. La Voz de Galicia, through Vive Camino, undertakes to communicate to users and participants in the action any possible impact of which it has knowledge as soon as possible through the means it deems appropriate in each case. Also, La Voz de Galicia states that it has taken all necessary measures within its means to ensure proper development of the action. Participants are responsible for the content using the framework of this action, which may not be illegal, offensive or discriminatory, or damage property or rights of others. Contestants are responsible for the veracity of the data provided to Vive Camino and La Voz de Galicia for their participation in this action. Venga ahora es vive el camino go!!! ajaja a por ellos a por los 20 o 40!!! Hola de nuevo Elías, hemos actualizado la aplicación móvil y ya deberías poder subir imágenes correctamente. La versión de Google ya está disponible para actualizar en la Store. En cuanto a IOS esperamos que validen la actualización durante las próximas horas. Un saludo. Muy buenas Elías, parece ser que hay un error en ese apartado de la aplicación móvil. Tomamos cuenta de él para resolverlo en la próxima actualización que realicemos. Gracias por el aviso. Recordáis que no gana el primer en llegar a 20, se sortea entre todos los que lleguen. No tengáis prisa por conseguirlos, tenéis unos 10 días, por lo que poco a poco y mucho ánimo. Saludos! Qué chulo, me quedan 5 para llegar al mínimo de sellos, habrá que ir a por ellos. Ya tengo 20, son muy sencillitos de conseguir. pos ya me ganas yo aun empeze hoy.